The Grasshopper is a fun fly to tie and fish. Just remember that to make it look real it has to be twitched, not Dragged. Thread : Brown or olive green. Tail : Pink, light, wool or similar. Body : Dubbed fox furs, starting from the tail with a little pink, then a mixture of light green, fawn, straw colours. Ribbing : Narrow green flat tinsel, then lay along top of body a small yellow hackle feather and a bunch of deer hair a little longer than the tail. Legs : Cree hackle feathers coated, and allowed to dry, with Vinyl Cement and tied along the body past the tail. Hackle : Cree trimmed short. approx. 6-8 mm) to form dense head. 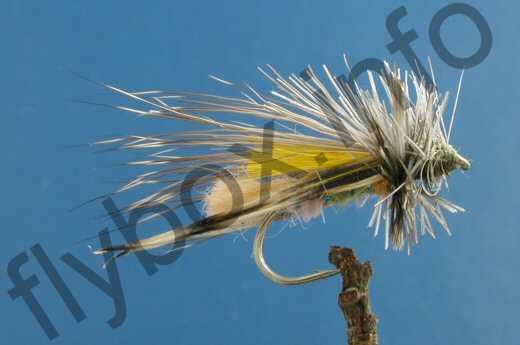 Currently there are no comments about the Grasshopper fly pattern from other fly fishermen yet.